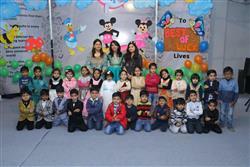 Panchkula - A Farewell Party was organized for kindergarten kids of SKYworldschool .The kids were wearing colourful outfits and were looking very cute. The teachers prepared a puppetshow with nursery rhymes and some dance performances on their favourite cartoon character’s track like MOTU PATLU, SHINCHAN, CHOTA BHEEM etc. The hall was decorated with colorful cute characters like MICKEY MOUSE, MINI MOUSE, DONALD DUCK etc. The kids also tapped their feet on their favourite tracks and enjoyed seeing their teachers on the stage. A huge cake, wishing them all the best for their new beginnings was cut down by the students and teachers and everyone was mesmerized by the happiness and joy spread in the air. The kids enjoyed their party tiffins and shared with their friends, they were made to play different games and were asked to discuss their feelings. They were given chocolates as their farewell gifts. The kids were wished good luck with hugs and smiles by their teachers for their new beginnings.